NaNoWriMo PreViz: Vote your Heart Out! It is October 9th, and there are only three weeks left until the beginning of NaNoWriMo, (National Novel Writer’s Month for the uninitiated.) This not-for-profit organization centers around a single challenge: Get aspiring authors around the world to attempt to write a 40,000 word novel in a single month! Last year I heard a critic (I don’t remember who) call December CraNoSubMo (Crappy Novel Submission Month), in a backhanded compliment that many people will take their rough draft manuscript and try to get it published. I have no doubt that thousands do, and my sympathy goes out to slush files everywhere. But for those with some talent, vision, and the work ethic to keep working on their manuscript, NaNoWriMo has the potential to entertain the world in addition to the writer’s equivalent of a marathon. National Novel Writer’s Month Goes Scott Pilgrim! For the last two years while I worked one full and one part time job while attending school part time, I attempted NaNoWriMo but did not succeed in terms of word count. My Beta Society is currently enjoying the third draft of the story of the first Gray Wanderer (see The Slave of Tour Hote for more details) and the world 2,000 years before Ryan MacOrin set foot in the Martel Kingdom. This year I will only have, at the very most, two jobs to occupy my time, instead of two plus college. 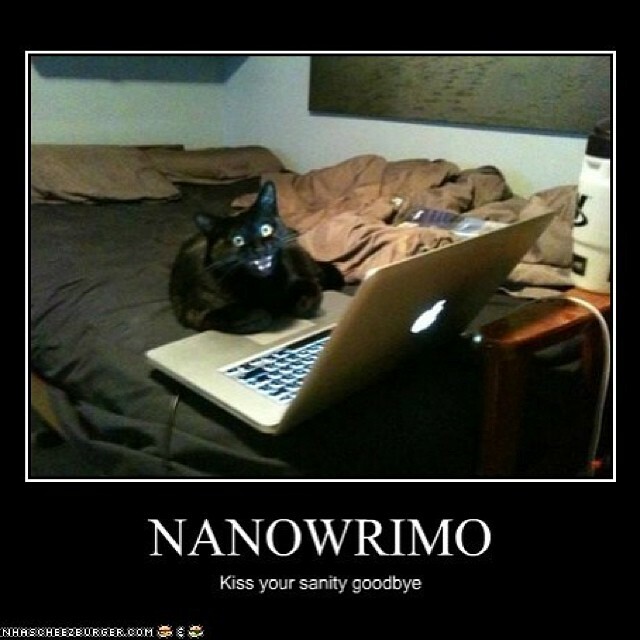 I’m chomping at the literary bit, but one of the rules of NaNoWriMo only allows prewriting before November 1st. So I am willing to offer a voice to my gentle readers as to the nature of this year’s novel. I have a few novel ideas I have been tossing around waiting to crawl forth. Some of these are longer-form novels but NaNoWriMo victory comes at the 40,000 word mark. I will give you the tentative title, genre, and story question for each. Old Blood: (Urban Fantasy) When Stephen Roy is bitten by a werewolf he must find a way to survive the centuries-old war between vampires and werewolves. But can he survive when his friends think he’s insane, a killer vampire is on his trail, government hunters, and a pack that doesn’t want him in the first place? Giant’s Rage (The Trials of Adrian Campbell Book #3). When an unsolved murder brings two clans of hill giants to the brink of war with a major human city playing battlefield, it’s up to Adrian Campbell and the Reapers to keep the peace. But can they save Cincinnati in the face of killer werewolves, mortal assassins, raging giants, and a prophetic cycle that the entire river valley is doomed? Matt the Hero (Fantasy). When Matt Ward is denied apprenticeship with his father the town sheriff, he is determined to become a hero anyway. But can he succeed in the face of monastery life, an impossible teacher, bullies, and a killer curse laid upon him before he was even born? The Treasure of Blah Dee Blah (Fantasy Comedy). When Zedekiah is finally kicked out of his tiny mountain town he befriends a dragon just as outcast as he is. The power of their unlikely friendship is the only thing that can save his village, but can they hold their friendship together despite their predator/prey natures, a town that hates them, and a dragon army on the way? The Gremlin Equation (Science Fiction Adventure/Comedy). Gremlin Station may be the least desirable Lagrange station in the Sol System, but when pirates try to make it their stronghold the station’s collection of losers, criminals, and oddballs sets out to defend their home. With political divisions, technical failures, and a production line of semi-sentient children’s toys in open revolt, the pirates may be the least of Gremlin Station’s problems.